A Ruby Book "Hajimete no Ruby"
drogus and the next post will be from Samuel Kadolph. Have you ever heard of a Ruby book Hajimete no Ruby? Most of you have not, I guess. Because it is unfortunately available only in Japanese language. Today I am going to introduce this title to you. 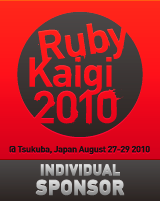 Hajimete no Ruby(O'Reilly Japan 2008), literally Ruby for the first time, is a book of Ruby for readers who are experienced in other programming languages. The author is @yugui. O'Reilly Japan seems to have a convention that when they are to translate Learning Foobar into Japanese, they name it as Hajimete no Foobar. But Yugui's book is not a Japanese translation of Learning Ruby but a newly written book. As I mentioned previously, this book is not a introductory book to newbies. Inwardly, readers are expected to have knowledge of fundamental computer sciences, especially object-oriend programming. Outwardly, in this book the installation instructions are just a section of the appendices while such guide tends to be placed in early chapters in typical programming language books. Aren't you excited to see words like Lisp and ALGOL? If you are, this book is for you. Following chapters are dedicated to primary language components, namely Arrays and Hashes(Ch. 2), Numbers(Ch. 3), Strings(Ch. 4), IOs(Ch. 5), Variables and Expressions(Ch. 6), Methods(Ch. 7) and Objects and Classes(Ch. 8). The final chapter is for topics beyond the book. You can't help bursting out laughing when you know that yugui recommends these gems: rake for example of DSL, ruby-debug for better debugging, active-support for example of standard library extension, and evil-ruby for studying ruby internals! If you feel disappointed that this book is not translated to your language, please request O'Reilly Japan to translate in your language and publish it.